I am excited to be back from my break. I took August off to catch up on some things and prayerfully prepare a schedule for my kid’s school year so that I am able to have more time to write. 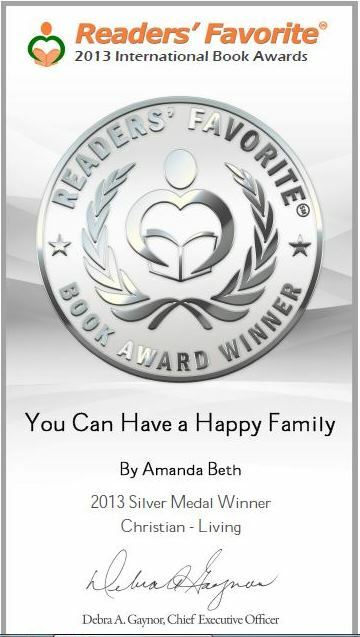 I checked my email messages when I returned and found some encouraging news regarding my first book “You Can Have a Happy Family: Steps to Enjoying Your Marriage and Children.” Last month, I was informed that I was a finalist in the Reader’s Favorite International Book Contest. It was announced last week that my book won a silver medal in the contest, and it will be featured in the largest International book fair in America this November in Miami. Receiving this award is a great blessing, not only because it opens the door to reach more people with the message God gave me to share in that book, but it’s a humble reminder to keep my confidence in Him and persevere. In April 2009, God called me out of leading Bible studies in my home to follow Him and write about what He’s done in my marriage and my family. I was ecstatic to be called, so I didn’t hesitate even though I had no writing experience. So do not throw away your confidence; it will be richly rewarded. You need to persevere so that when you have done the will of God, you will receive what he has promised. For, “In just a little while, he who is coming will come and will not delay.” And, “But my righteous one will live by faith. And I take no pleasure in the one who shrinks back.” But we do not belong to those who shrink back and are destroyed, but to those who have faith and are saved. A Christian friend recently told me that persevering is the hardest thing to do. In the verses above, we are first instructed not to throw away our confidence because that’s what helps us persevere. Our confidence is not in what we can do. Our confidence is in what God can do through us. Our confidence is in His promises that He will equip us to do what He calls us to do. When we take our eyes off Him, we shrink back (lose confidence) and don’t have the strength to persevere. When difficulties come, and it doesn’t appear God is going to come through for us, it’s tempting to take our eyes of Jesus and lose our confidence. I’ve experienced many trials since I started writing. It took me over two years to publish that first book. During those years, I received a lot of rejection. My family’s health and finances were attacked. My marriage was attacked. There were many times I felt completely alone. I often prayed for God to call someone else and let me quit. I didn’t want to persevere. But I felt like Jeremiah when he said: “But if I say, ‘I will not mention his word or speak anymore in his name,’ his word is in my heart like a fire, a fire shut up in my bones. I am weary of holding it in; indeed, I cannot” (Jeremiah 20:9). By the time the book got published I was worn out. I felt like I crawled across the finish line, only to find out my race had really just begun. With publishing came greater difficulties and rejection. God has had to regularly remind me of Hebrews 10:35-37 to keep my eyes on Him and persevere. A year after the book was published, I felt led to make some changes and republish it. With republishing came more difficulties. A year later, when I thought I could do no more with it, God led me back to it again. That’s when I felt led to enter it into the contest. Because of all the problems I have had with it the last four years, and all the doors that have been shut on it, I didn’t expect to receive any recognition, let alone win a medal. I know we are not supposed to seek man’s approval. But for me, receiving an award for writing is encouraging proof that God has truly equipped, and will continue to equip, me to do His will. The only approval we need is that God is with us. Our confidence is in Him. If you feel like you are losing strength, shift your focus back to Him. Keep your confidence in Him. He will give you all the strength you need to persevere, even when you want to give up. We praise You for preparing and equipping us to do Your will. Help us to keep our eyes on Jesus so we have the strength to persevere. We praise You that You are our confidence. We can do all things through Christ who gives us Your strength. I am a wife of seventeen years, mother of four children, and author of “You Can Have a Happy Family: Steps to Enjoying Your Marriage and Children” and two devotionals: “The LOVE Walk: A 15-Week Devotional on 1 Corinthians 13:4-8” and “Armor of Light: A 7-Week Devotional on Ephesians 6:10-18.” God has done an amazing work in me and my family since He rescued me fourteen years ago. Because of His unfailing love, I am passionate about sharing His love with others. 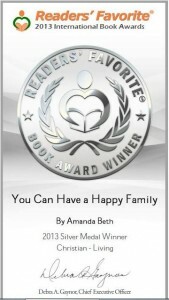 You can learn more about my testimony and writings on my blog (SharingTruths.com) and my website (AmandaBeth.net). Beatitudes: "Blessed Are Those Who Are Persecuted"
Amanda congrats! Awesome in getting the silver! Great to have you back too. Rosh Hashanah and The Last Trumpet When Paul penned the above scripture what was he really trying to tell those who believed in Yeshua (Jesus Christ)? Why did Paul use the terminology of the "last trumpet?" The videos below will explain this in detail!